On this special night where is Father Christmas. You can track Santa from here. May I on behalf of the staff and governors thank you for all your co-operation during the year. It has been a very eventful term with some great highlights. Please take time to browse our site to view some of the activities that the staff and children have undertaken. May I also thank you for all the cards and presents given to us this year. 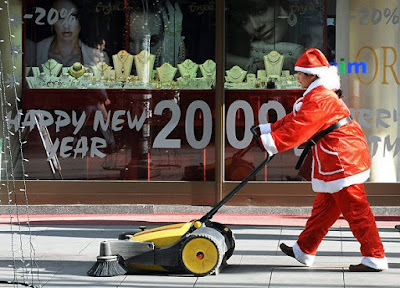 We are all well aware of the current economic climate and these gifts at this time have been very much appreciated. Year 5 have been writing poetry with Mr. Jones. They used the japanese form of poetry called haiku. Each haiku is made up of three lines. The first line has five syllables, the second seven and the third five. Haiku can be used very effectively to describe events such as the Nativity story. I challenged them to retell the Christmas story using haiku. They used Photo Story 3 to make a video of their work and collected images to illustrate the story, recorded their voices and added music at the end when they put their photographs on as a trailer. This was used in our Christmas assembly last Friday. This is a wonderful way of celebrting the true meaning of Christmas. May I take this opportunity to wish you all a Merry Christmas and a Happy New Year. We will return to school on TUESDAY JANUARY 6th 2009 for the new term. 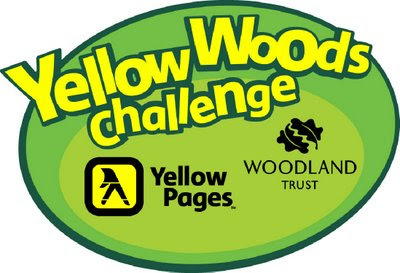 We’re taking part in the Yellow Woods Challenge…… the environmental competition run by Yellow Pages, working with the Woodland Trust and our local council. 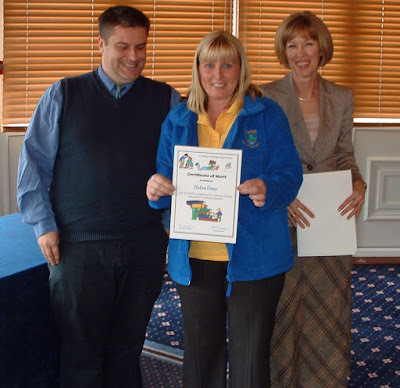 The aim is to recycle the highest number of old Yellow Pages directories per pupil and win cash prizes for our school. And for every pound Yellow Pages awards to schools, they give a matching pound to the Woodland Trust. When your new Yellow Pages directory is delivered, please help our school and the environment by recycling your old one. Children should only collect old directories from home and from people they know, with your permission. Please ask your family, friends, work mates and community groups to help our school by donating their old directories, too. We need to collect the old Yellow Pages directories as soon as possible. If you have any questions about the competition and our involvement, please ask at the school. For detailed information about the Yellow Woods Challenge, take a look at the Parents’ Pages on http://www.yellow-woods.co.uk/ or write to: Public Relations, Yell, Queens Walk, Oxford Road, Reading, RG1 7PT. The Local Education Authority is introducing a new dinner money collection system in the new year. ALL DINNER MONEY FOR THE WEEK WILL NEED TO BE PAID IN ADVANCE ON MONDAYS. I realise that this may prove inconvenient for some, but due to the complexities of the system Mrs. Thomas will need to input the information and balance the money on her computer each Monday. Your co-operation will be gratefully appreciated. This term’s house point initiative has been very successful. Each house has been successful in wining the weekly rounds. Here are the total points scored by each house during the term – OWAIN – 1838; GWENLLIAN – 1644; CARADOG – 1389; BUDDUG – 1246. Well done everybody. 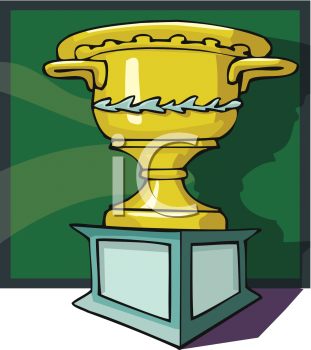 The winning house wins two weeks off school; there is also three runners up prizes of a fortnight off schools as well. If you are fortunate to have a new Mobile Phone from Father Christmas, what are you going to do with your old one? Gelli Primary is now going to start recycling old mobile phones and hopefully raise money for school in the process. We will start recycling mobile phones after the Christmas holiday! Mrs. Sharon Davies has been a Special Support Assistant with us here at Gelli over the past few years. She is leaving to take up a new post in the civil service. We wish her well in her future career and hope that she continues to be an active member of our PTA committee. Thank you Mrs. Davies for all your help and expertise. Our pupils at Gelli Primary School are hoping to follow in the footsteps of Lewis Hamilton and become Britain’s next Formula One champions. Year Six pupils have spent months designing and building their own mini F1 racer ready for a national competition. They went head to head against 24 schools from across the country today in the Welsh final of the F1 in Primary Schools competition. If successful, the pupils will enter the UK-wide finals in Birmingham in January to compete for a place in the world final held in Malaysia next summer. Year Six pupils formed a team of seven children taking part in the project. 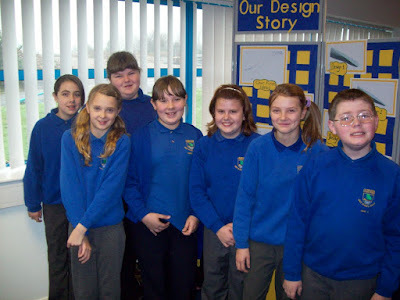 Lucy and Holly were the Team Mangers, Alicia, Shauna and Gemma the Designers and Rebecca and Jack the Computer Designers. The team is called the Rhondda Rollerz. Mrs. Fraser added: “The children have spent most lunchtimes working on the car for the last month and a half. They’ve also stayed behind after school a couple of times a week, so it’s been a huge effort. This is the first time the competition has been run for primary schools and I’m lucky to be working with some really bright pupils." The mini F1 car is made from balsawood and uses a gas canister to power it along at speeds of up to 60mph. Today we held an art exhibition in our school hall. Thanks to all the children for contributing their work; to the staff for their patience while the work was being undertaken; to Mrs. Davies, our subject leader for art for organising the event; to Mr. Russell for his ideas, framing the exhibits and displaying them. Thank you parents, grans, grandads and family members for your support. Your attendance made the event very special for the children. I am very proud to say that we have some very talented artists in Gelli. Well done everybody. llongyfarchiadau bawb. It has become a tradition for pupils at Gelli Primary School to visit the Millennium Stadium to watch the autumn international fixture between Wales and Canada. Ten staff members and 42 pupils left Gelli at 5. p.m. We walked through the crowd arm in arm to our seats. We sang Cwm Rhondda and Delilah with the crowd, cheered the Welsh team and even did a Mexican wave when the game was stopped for an injury. We had a great time and represented the school with pride. We got home at about 10.40 p.m. tired but having seen our country win. This week the Early years and Key Stage 1 children will make their annual visit to see Father Christmas. This year Santa has come to the Rhondda Heritage Park museum and our Nursery and Reception children will visit him on Thursday 27th with Year 1 and 2 visiting him a day later on Friday 28th. You will already have received a letter from your class teacher giving you details of the itinerary and the cost of the trip. Please will you make sure that payment for the trip is received as soon as possible. The pupils and staff are delighted to announce an exhibition of the children’s art to be held in our school gallery on Tuesday 25th November 2008. The children have produced some stunning art and we know you will be proud when you see their beautiful pictures professionally framed and mounted on display stands. The Visual Arts play a big part in the life of the school and is an area that every child can enjoy and play a full part in. The Art Curriculum encourages display, so having their art framed and displayed will be a big occasion for them. Someone special to show it to will add a lovely finishing touch for them so make a space in your diary for this special event! These original framed works of art can be purchased by the artist’s family for £6 each. 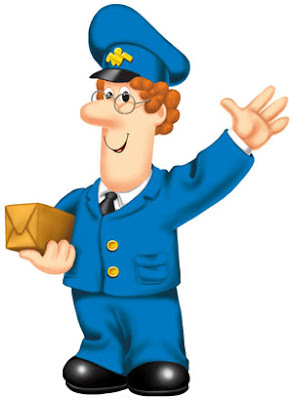 If you would like to purchase your child’s picture but cannot come to the exhibition, just send the money in an envelope and we will look after delivery. The exhibition will not be an annual event, so do come along, bring your camera, bring family and friends and with your help we can make it an occasion to remember for everyone. I would like to wish a warm welcome to parents, grandparents and other family members to join us to view your children’s work. Nursery and Reception children will be in the hall at 3.00 p.m. Year 1 & 2 children will also be in the hall at 3.10. You are requested to collect your children from the hall once you have visited the exhibition. Junior children will join them at 3.15. Refreshments will be available. Please make a big effort to come and see your child’s work and make this exhibition a success. We will commemorate the 90th anniversary of the cessation of hostilities during the First World war with our children this week. 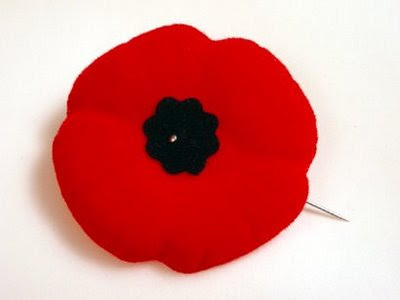 Veterans and members of the British Legion will visit school to discuss their experiences and we will observe the minutes silence at 11.00 a.m. next Tuesday. Children are invited to make a small donation to the poppy appeal if they wish; however, we understand that many of you will have already done so in other ways. 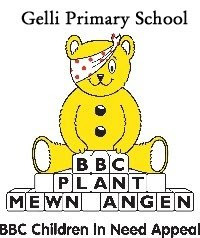 The BBC Children in Need appeal again comes to Gelli again on Friday 14th November. The children will be invited to "defy school rules" and NOT wear school uniform on that day. If they do wear school uniform, they will also be FINED. We invite you to contribute towards a "small change" donation to support those children who are less fortunate than us at this time. We will have our customary talent contest duing the afternoon, so contact Mrs. Johnson or Mrs. O'Gorman for an application form. Details will be circulated by pupil post as usual during this week. The latest newsletter No 9 for the term was distributed via pupil post on Friday 7th November. Details of the Christmas productions and activities were included along with details of our latest Healthy Schools initiatives, including information of our second award. This letter appears on the newsletters page of the school website. There is also a reminder of the proposed Art exhibition which will be held in the school hall on Tuesday 25th November at 3 p.m.
Visit the Gelli Primary School website for further details. 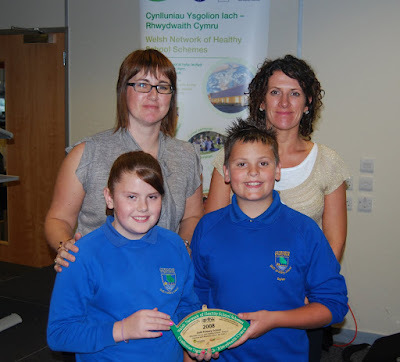 On Tuesday 4th November Mrs. Fraser, Mrs. Dyer, Lucy and Dylan visited the annual Healthy Schools Presentation Awards at the ESIS building, Ty Dysgu, Nantgarw. The ceremony celebrates the achievements of schools who are working towards the accreditation and each year schools agree an action plan to meet the criteria for each phase. Last year, our work on the school environment during Focus week, our nutrition and hydration policy and other activities impressed the assessors and we were awarded our second plaque to add to the one achieved in 2007. Dylan and Lucy demonstrated some of the videos we have published on this blog to promote our work here at Gelli. They represented the children in receiving the plaque on behalf of all the children, staff and parents who have worked so hard in achieving this award again this year. We are busy planning another action packed year in our quest for a third plaque. Well done Gelli. llongyfarchiadau. 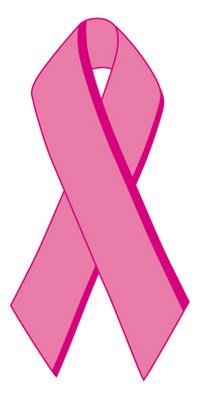 Wear it pink is the biggest and best pink day during October, Breast Cancer Awareness Month. This year, Breast Cancer Campaign is daring everyone in the UK to wear an item of pink on Friday 31 October and donate any spare change that you have to the charity to help us beat breast cancer. We will be taking loads of photographs during the day and class activities will be posted on the class blogs. Help us to raise money for those who re less fortunate than us if you Dare to wear pink on Friday 24th October. 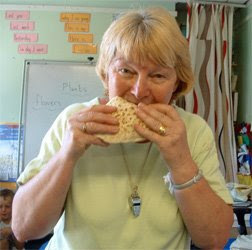 Mrs. Edwards and our fantastic catering staff have launched their new menus this week. You can see them in detail on the information for parents page and soon on our catering staff web page. 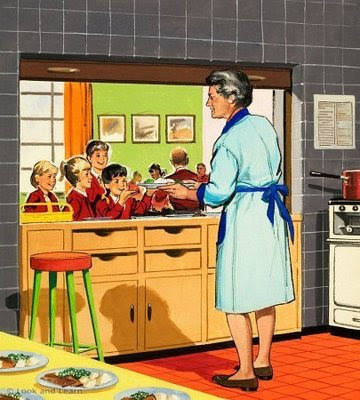 "There will be more choice on these menus" said an excited Mrs. Edwards. "We will be offering more home cooked meals such as Homemade Corned Beef Pie, Fish Pie, Savoury Sausage Pie, Vegetable Curry and Sweet and Sour Chicken. I'll be doing most of the cooking myself. We are also introducing a new concept Pasta Pots." These will give the children of Gelli Primary School a more balanced menu. Why not try our new menus. You can order a dinner from Mrs. Thomas every Monday. Please can you provide us with the correct money. The weekly amount for the younger children is £7.00 with £7.25 for Junior children. 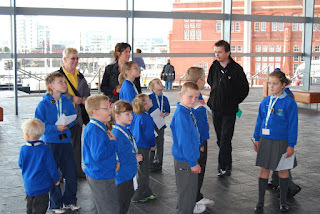 On Wednesday the new school council visited the Welsh Assembly in Cardiff Bay. Mrs. Dyer and Mrs. Dunn and I accompanied the children to hold a debate in the old council chamber. 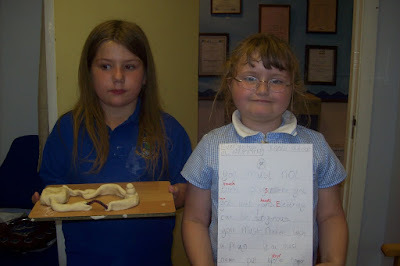 The children were fantastic ambassadors for Gelli Primry. Our guide for the day, Rhinallt, commented "We love to have children from your area here at the assembly, they're polite, hard woking and really enjoy the whole experience." We were also met by our Assembly member Mr. Leighton Andrews who talked to the children and agreed to come to school to participate in a school council meeting when his busy schedule allows. Check out the School Council page and the School Council blog for more details. Newsletters have been updated on the newsletter page. Click here to download these if you have not received them by pupil post. I am very pleased to announce (on one hand) that Mrs. O'Gorman our Key stage 2 manager was appointed to the post of Deputy head teacher at Penygraig Junior School on Friday. It is also disappointing as Mrs. O'Gorman has been a key member of staff over the past few years and we will miss her expertise and skills. 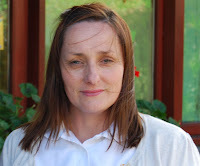 Mrs. O'Gorman was our acting deputy for the majority of last year and carried out her duties with distinction. 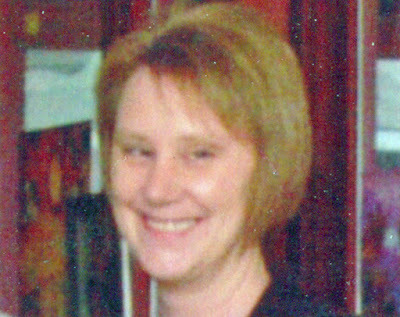 In addition she has directed numerous concerts and successfully directed the Key stage 2 production of High School Musical at the Phoenix Theatre. Mrs. O'Gorman will be re-united with another ex Gelli Primary School teacher as Mrs. O'Gorman will succeed Mrs. Vaughan who was appointed to the post of Head teacher at Penygraig in the summer. Although tinged with sadness our best wishes go to Mrs. O'Gorman on a well deserved promotion. Llongyfarichadau. 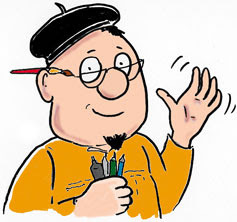 Over the summer holidays I have been experiencing severe technical problems accessing our website and it's contents. I fear that I am running out of options to recover the files that were destroyed when the hard drive of my laptop decided to give up the ghost. I am in the process of redesigning the site but fear that it will be some time before the whole site will become fully operational. Please excuse the interuptions while this is being dealt with. I will endevour to replace the several documents and pages which were useful for parents such as the letters pages and prospectus. I will continue to update you on events when they become available. This week we will launch information about our after school clubs and arrangements for the Grandparent's Concert. 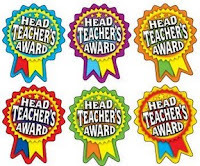 In addition we will announce our new School Council members and who were awarded head teacher awards this week. A newsletter was distributed on Friday and will be published as soon as possible. The long wait is nearly over. 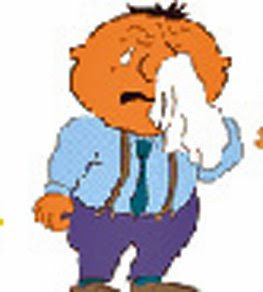 Mums in all parts of Gelli and the surrounding villages will be breathing a sigh of relief when school re-opens for the Autumn Term next Tuesday 2nd September. It'll be time to set the alarm clocks and get up in time to join breakfast club then begin the new term in your new classes. We will welcome our new Deputy head teacher Mr. Hughes who takes up his appointment. Mr. Hughes will teach in Year 6. We will also welcome back Miss Rachel Jenkins who will succeed Mrs. Dunn as our Language Support Teacher. Due to technical problems the School Website is temporarily unavailable and cannot being updated. I hope to resolve this situation very soon. The content remains the same as last term. Today is our Class of 2008's last day in Gelli Primary. During their time with us they have always been excellent role models, they have excelled academically and been great ambassadors on the sports field – not only rugby, football (boys and girls), cricket, cheerleading and of course our hockey squad who became the first team from Gelli to qualify for a national final. 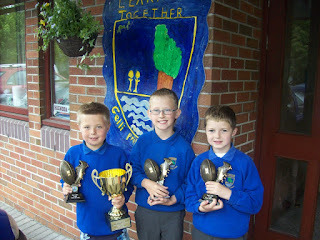 They have also welcomed a number of pupils into their class as a result of those children moving into our school. They now leave us with our thanks and best wishes for the future and hope that they fulfil their potential in Treorchy Comprehensive. We look forward to reading about their achievements. I would like to thank on their behalf Mrs. O’Gorman, their current class teacher, and all the other members of staff the have taught them during their time at Gelli. They will always be a special group of people to me as they will be the only group of children that I will have taught here and they will be always my first year 6 cohort as a head teacher. To borrow a “Big Brotherism” as we evict them from Gelli Primary here are their “BEST BITS.”Click on the video below to see if you agree. During the Leaver's Ball we awarded the annual Gelli Primary Year 6 awards. Sports Personality of the Year - Tom Dunning, Liftime Award - Stacey Symons, Achievement Award - Megan Atkin and the "Star of the Year" - Josh Wilson. Mrs. Date, our Intervention Learning Support Assistant, has been participating in a literacy intervention project this year in partnership with the LEA Support Services and Cumbria LEA. The project has given us a strategy for supporting children to improve their literacy skills and has been very successful. On Monday 14th July Mrs. Date was presented with a certificate for completing the accreditation for the course at a presentation in the Conservatory at the Rhondda Heritage Park Hotel. She is pictured here receiving her certificate from Richard Edwards, the Education Psychology Service and Gaynor Cynan Jones Senior Co-ordinator Learning Support Service. Saying goodbye to Year 6 is always a difficult thing to do.... BUT in Gelli we do it in style. This year like the previous leavers, our top class hit the catwalk and strutted their stuff..... put on their party gear and boogied down all night in the Football Club. See which local celebs were on the A list by clicking on the video below. Since September 2006 Gelli Primary School has been twinned with Mbale School in Uganda. On Monday 14th July pupils from Gelli Primary School will join members of the Phil and Kath Rickards on the School Walk. 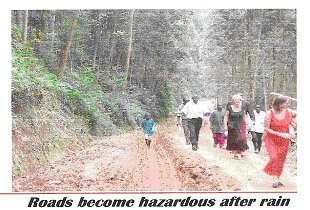 In Mbale, communication and transport are difficult. 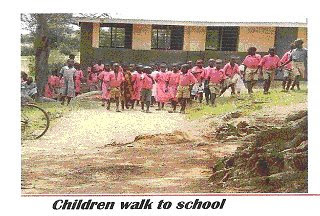 To raise awareness of the plight of the school children in the area, Phil and Kath Rickards are walking between the 40 schools that have partner schools in Mbale. Money that will be raised through sposnorship and donations will be used to improve educational needs in Mbale. A leading Ugandan has said "The only way out of poverty is education." Please support the partnership between Gelli and Africa to assist those who are less fortunate than us improve their life. Thank you. Diolch yn fawr. Year 5 and 6 will participated in a sponsored walk with the PONT project to Treorchy Primary via Ton Infants, Ton Pentre Junior School and Pentre beginning from school at 12.30p.m. A “Copper Coin” collection will be taken and proceeds donated to Mbale School, Uganda. Parents wishing to meet with staff re requested to make an appointment after school. If the teachers have indicated that there are no issues to discuss please complete the parents comment form attached to your child's report. This will be included in your child's personal profile. The children will present their final performance at Gelli Primary this morning. The assembly will be held in the school hall and parents of year 6 pupils are invited to join us for what is traditionally a very emotional morning. Can we ask parents to be seated at 9.15 at the latest as it will be a tight squeeze to fit everybody into the hall. After the assembly, please will you join us and the children in a cup of tea and biscuits to celebrate. Early Years and Infants Concert 1.30 p.m.
Industrial action being taken by UNISON. Children are not required to wear school uniform today. We will have our final assembly of the year. During the morning year 6 children will swap presents, sign shirts and bid farewell to Gelli Primary. We wish them well in the future and hope that they continue to be successful in Treorchy Comprehensive School next year. School will close at 1.15 p.m. for the summer vacation. Next year staff will be involved in training on Monday September 1st. SCHOOL WILL RE-OPEN FOR CHILDREN ON TUESDAY 2nd SEPTEMBER. The PTA would like to announce the winning raffle prize number. Please will all raffle winners collect their prizes from the school. Despite Saturday's heavy showers (which forced the fete to be held in the school hall and classrooms), nothing could dampen the spirits of the inhabitants of Gelli and the parents and friends of the school. Everybody flocked to school to enjoy the numerous stalls and games, face painting and refreshments. Through the generosity of the participants early estimates seem to suggest that last year's total of £980 could be equalled. There was also an evening gig at the Railway Inn where proceeds were donated to the PTA funds. The organising committee (led this year by Mrs. Becky Sims) would like to thank all parents and friends who donated items to the fete and everybody who attended and gave so generously to the cause. The PTA have over numerous years contributed resources to the school such as a Plasma screen for nursery, reading materials to augment the school library and always provide gifts for the children at Easter and Christmas. Thank you very much. Diolch yn fawr iawn. On Friday 4th July, our Hockey team travelled to the Maldwyn Sports Centre Complex in Newtown Powys to compete in the finals of the Welsh Primary Schools Tournament. Having qualified through the two regional tournaments, we were up against the other BEST nine teams from regions around Wales who had also qualified through winning their regional events. The ten teams were divided into two pools of five and would play in a round robin format. Each team would play four games with the top two teams in each pool qualifying for semi and final play offs. We were drawn against schools from Sychdyn and Pen y Bryn from Mold, Nantymoel representing Bridgend and Llancarfan representing the Vale of Glamorgan. This was a huge step in class for our players. Many of the opposition players represent hockey clubs in their villages and some play representative level for their county. Our first match was against Sychdyn. We lost 1 – 0. The opposition were more physical than us and pressed our defence into making several high class saves. Ceri in goal led the defence with some class saves and long clearances. This was a close match with nothing between the teams. Sychdyn’s superior experience was probably the deciding factor in their victory. Our team did themselves proud. In our next match we were drawn against pre tournament favourites, Pen y Bryn. In their first match they had won 3 – 0 and looked ominously efficient. Again, Ceri in goal led the defence who kept the sharp Pen y Bryn offence at bay. After two minutes they scored. Our defence held them out right until the final minute when Ceri was beaten by a stinging shot which would have beaten any goal minder in the tournament. Despite playing well, again we lost narrowly to a team that would top the group. we played our penultimate match against Nantymoel. For a vast majority of the match we pressed their goal and were unfortunate to hit the post. This time Ceri and the defence hardly needed to make a save. The game ended goalless with both teams earning a point each. However, we felt that we were the better team and deserved to have won the game. We had finally won. The players celebrated as if they had won the tournament. After all the games had been played we looked at the board and we had come in eighth place on goal difference, so we are the EIGHTH BEST HOCKEY TEAM IN WALES, some achievement. The squad have come a long way in a short time. We have a young squad with Ethan in Year 3, Jenna in Year 4, Bradley in Year 5 as a basis for a strong squad in the future. Coach Hatch can also be very proud of their accomplishments and with super supporters Mrs. Date and Mrs. Dunning (who helped transport the pupils to the earlier rounds) the future is bright. The squad also looked very smart in their new kit (sponsored by NRG). Thank you very much Mr. Gimson for your kind donation. The whole day was a fantastic experience for all who participated. A special thanks to Mrs. Hatch (or Mummy Hatch as she will now be known from henceforth) for driving the mini bus so skilfully. This was a tremendous achievement by our pupils and coaching staff. They represented the school and our area with dignity. It was very pleasing to hear that Miss Hatch received several glowing comment not only about their play but also about their sportsmanship. WELL DONE GELLI. 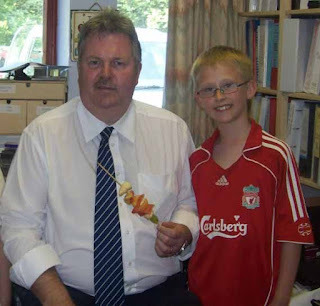 Further articles (including Mr. Jones' videos) will appear on the PESS page on the school website soon. This afternoon Year 2 have been doing an investigation about Electricity. Here are Charley and Catherine to show you what they did. "We made a circuit out of salt dough" said Charley. "After we did this I wrote a description of everything we know about electricity." said Catherine. The other children are walking around the school to see what appliances need electricity to work. Others are seeing what appliances work with batteries and which need mains electricity. Well done girls. onwards, but the later the better as we have limited storage in school. for running stalls to begin to set up either in the yard area or indoors if wet. Thank you to the staff at Futureglaze fror their kind donation. Gelli Primary School is proud to announce the first of three new kit sponsorhip deals with local firms. NRG Heating agreed to sponsor our football team kit for the coming season. 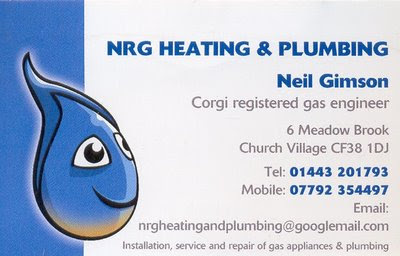 On behalf of the children we wish to thank Mr. Gimson from NRG Heating and Plumbing for his generosity. At present the kit is being embroidered with our school and sponsor logo. This is a duel purpose kit and our hockey squad will be able to wear it on Friday when they travel to Newtown to represent the County in the Welsh Hockey Championships. Check back here for details of our other kit sponsors which we will be able to announce soon. I have needed to make some changes to some arrangements for some activities before the end of term as a contingency for the possible industrial action being taken during the last week of term. The INFANT SPORTS AFTERNOON will now take place on FRIDAY 11th July. The INFANT CONCERT to celebrate Mrs. Lee and Mrs. Dunn's retirement will now take place on Tuesday afternoon July 15th at 1.30 p.m.
Further details will be posted here and sent home by pupil post. You may have read in the press that UNISON are proposing to take strike action on WEDNESDAY 16th & THURSDAY 17th July. I will inform parents of any disruption to school as soon as I have any information. This will be available by pupil post and in electronic form on the blog and on the website. 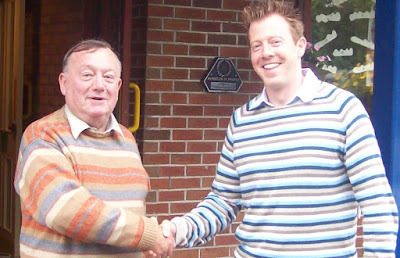 Mr. Graham Dunn, our Chair of Governors, welcomes Mr. Marc Hughes to Gelli Primary School. Mr. Hughes joined the staff today to participate in our annual self evaluation day. The staff analysed the school performance data in order that the areas for development that were identified can be formulated into next year's school development plan. "We are delighted that Mr Hughes has been able to participate in this process. It will help him to get to know the staff and the workings of the school in readiness for taking up his role with us in September. On behalf of the Governing body I wish him every success in his new role." said Mr. Dunn. The staff divided into two teams, one led by Mr. Jones, the other by Mrs. O'Gorman. They systematically went through a model self evaluation questionnaire constructed by the Atlantes Inspection team to evaluate the school's current eprformance against the seven key questions which ESTYN use to inspect schools. Thanks to all staff members who were involved. A newsletter promoting the PTFA Summer Fete was distributed by pupil post on Thursday 25th July. Visit the PTFA page to view it on the website. School will be closed on Friday 27th June as the staff will undertake the annual school self evaluation process. Gelli Primary School is pleased to announced the appointment of Mr. Marc Hughes as Deputy Head teacher. Mr. Hughes is currently teaching at Gladstone Primary School in Barry and takes up his appointment in September. Newsletter 12 for the summer term has been posted on the newsletter page. The following children were awarded Head teacher’s awards this week. Our FREE Fruit Tasting session has been a great success and we will launch the initiative on WEDNESDAY during morning break. Fruit portions will be sold at 20p each. 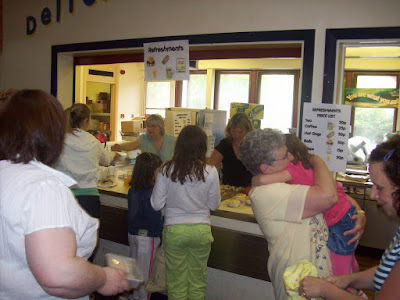 The Shop will be run from the doorway into the Canteen and children will come on a "first come, first served basis." If it is wet the children will come into the hall via the main enterance. We will keep you informed of this initiative via the blog and newsletters. Just to clarify that this initiative is for children in Year 1, 2, 3, 4, 5 and 6. Children in Nursery and Reception are already provided with snack. 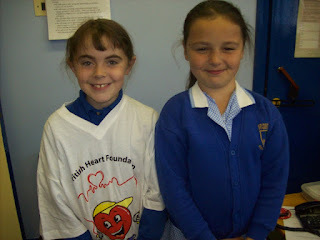 The total raised for the British Heart Foundation by our Jump Rope for Heart sponsorship was £475.90. In addition £158.63 will be retained by the school in order to purchase sports equipment for the playground. As recognition of the efforts of pupils who raised over £50, the British Heart Foundation will present “goodie” rucksacks to MIA SQUIRES and BETHAN MILES. A big thank you for all who made this initiative such a success especially Year 5 and Miss Lang who organised the skipping and to Miss Carly who co-ordinated the event. Mrs. Lee has informed me that she intends to retire at the end of the term. After a long and distinguished career, this has seen her teach countless generations of pupils in our village, she has decided to put away the chalk and enjoy a deserved retirement. Mrs. Lee is not with us at present and is recovering well from a recent health problem. We will not leave her slip away without taking the opportunity to wish her well in what we hope will be a long and happy retirement, but also celebrate a long career of success in developing the abilities of children of Gelli. I am sure that children who have spent time in her class will remember their time with her with great affection. On a personal basis, I will miss May’s advice, expertise and wisdom. As yet, we as a staff at Gelli Primary may not realise how much we will miss her. May had a wonderful gift of getting people to work together for the sake of the children. I will inform you later on in the term how we intend to mark Mrs. Lee … (and Mrs. Dunn’s) retirement. If you would wish to leave a message for Mrs. Lee and wish her well please comment on this page. A newsletter was sent home by pupil post ysterday. It is available on the newsletter page of the website. Year Three visited the archery centre at Glyncornel on Thursday 12th June with Miss Carly as part of the PESS partnership and Dragon Sports. This video can also be seen on the PESS page of the school website. The Boys Cricket Team accompanied by Miss Carly and Miss Hatch participated in a Dragon Sports Cricket Festival at Miskin Mannor Cricket Club. 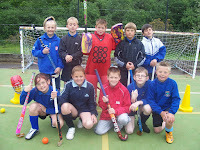 They played Llwyncrwn Primary in the opening match and were victorious. They also defeated Dolau Primary in their second game. Next up were our "new rivals" PONTYCLUN. Having made Mr. Roberts miserable for a week after beating them in the Sports Hall Athletics competition, the stakes were high. Pontyclun were winners thanks to their superior bowling. 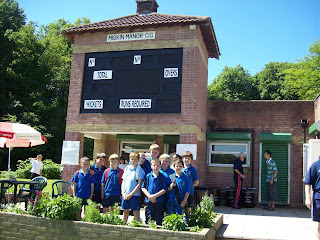 They went on to the final (where they lost in the last over, rather contraversionaly, to Hendreforgan Primary. 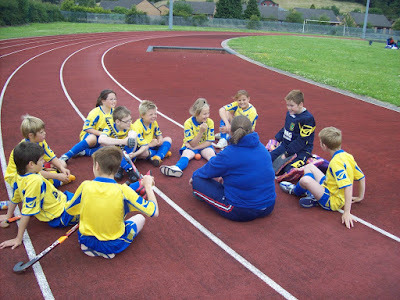 In our last game we beat Trehopcyn Primary. Here is a photograph of the boys - Josh J, Josh G, Jordan G, Jordan N, Josef M, Keiron D, Josh W, James, Ceri and Joseph A. - who played in front of the pavilion scoreboard at Miskin's picturesque ground. At the end of the day the organisers thanked the children for a wonderful festival of cricket and announced that we had been placed third in the competition. Llongyfarchiadau bawb, Miss Hatch a Miss Carly. The organisors were so impressed with the performance they invited the squad to come to play at Miskin before the end of the term.